He was lured back by the sight of the first Call of Duty in a Best Buy. He now plays games for one to three hours every day, he says. He’s currently playing Metal Gear Solid V: The Phantom Pain. 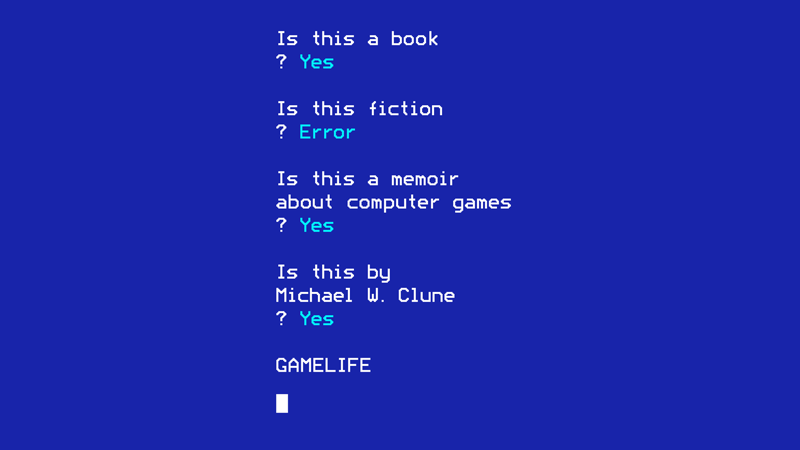 I interviewed Clune about his book and his experiences with video games for my podcast, Shall We Play a Game? Clune’s previous memoir, White Out, was about his addiction to heroin in his 20s. “My relationship to games is actually the opposite of my relationship to addictive drugs,” he said. “With drugs, I was continually obsessed with the first time I ever used. I was always trying to get back to that place. It was just like a rat race. And it left my life enormously empty, in that I was always trying to get something that I could never actually have. And it led to compulsivity and all of these negative consequences. In Gamelife, video games give Clune “a new direction to grow” as a child, away from people rather than toward them. He writes about seven different games: Suspended, The Bard’s Tale II, Ultima III, Wolfenstein, Elite, Pirates!, and Might and Magic II. They give him new imaginary (yet also solid and numerical) vistas to escape into, new ways of seeing the world. He describes the screenshots on the back of boxes on the shelves at the mall store Babbage’s as the “new eyes” he will be given when he plays a game. Gamelife is not filled with unmitigated praise for video games. As a child, Clune hated Super Mario Bros., perhaps out of resentment for being given a Nintendo Entertainment System for Christmas instead of his desired gift, Elite. Yet many others are indirect, expressed through the juxtaposition of the time he spent playing a video game with a childhood memory of playing outside with a friend, or watching a classmate get bullied, or trying and failing to find someone to play Dungeons & Dragons with. “We’re the first generation that had this technology shape our imaginative lives from a very early age,” Clune said to me on Shall We Play a Game? (I, too, am 40.) “That’s definitely what I’m writing about. It’s a technologically shaped childhood development, in a more intensive way than earlier generations, which had TV or movies or radio, because of the interactive element that games have. The book is, in part, “about what games can teach literature,” Clune said. Even many video game players argue that video games are not worthy of serious thought, Clune said.